Video is the ultimate way of combining all forms of media in a dynamic presentation. Moving pictures, stills, music, and voice - all these elements can be combined exactly how you want them to get your message across. You can't beat a high quality video production playing on a big screen for pure impact. Once you've made the video, the highest quality presentation will be from tape, but you can also distribute video on CD or via the net, which may offer other advantages to you. We have all the video production facilities to create any necessary video content and digitize it into the correct format for inclusion on CD. A CD ROM is the ideal choice in a situation when you have different information to offer different target audiences. A vast amount of information can be incorporated onto a CD. Through a menu structure you can allow these audiences to immediately access exactly what is relevant to them, rather than going through information which they don't need. For the majority of projects, DV cameras have enabled us to gather high quality footage for a fraction of the cost of regular broadcast video making video a viable option for all clients. We always match the production equipment to the needs of the production. 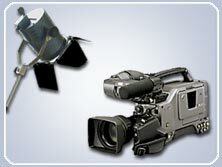 We work in the popular Betacam-SP and Digital Betacam formats where necessary. POST PRODUCTION - Our studio is designed to meet every budget. From S-VHS post-production to the latest in Digital Non-Linear editing. EXPERT TITLE & GRAPHICS - We can create titles and graphics for every production. Our CG system offers the flexibility to design background graphics and logo's to fit your company image. ANIMATION - Designs can be created to your specific needs. From custom animations to stock animations. Sit down with our design artists and share your ideas.